The Supreme Court today agreed to hear a Public Interest Litigation which demanded immediate measures for curbing criminalization of politics and a direction to the authorities including election commission to comply with the law commission and apex court directions in this regard. “Electoral Reforms have been engaging the attention of the Parliament and Union Government for a long time. The ECI and Law Commission of India (Hereinafter LCI) have been very regularly addressing the union government in the last 17 years for electoral and political reform. Although some measures were implemented in the past to remove glaring lacunae in the law but those are insufficient. Issue a writ, order or direction to the respondents to bring in Electoral Reform and to make Rules, Regulations and Code of Conduct for de-criminalization and de-communalization of politics and for eradication of Corruption Casteism and Nepotism from electoral system”, said the PIL filed by lawyer Ashwini Upadhyay and argued by senior lawyer Sanjay Hegde. An apex court bench is already in the process of cleansing politics off criminals issuing periodic orders and the fresh PIL has been tagged along with that to be heard on January 9. The law commission headed by Justice A P Shah had early last year submitted a slew of recommendations to Supreme Court saying the law in its present form is incapable of curbing the growing cancer of criminalisation of politics. In significant recommendations, the commission has asked for speeding up of the probe and trial of cases involving influential persons to ensure they don't manipulate the criminal justice system and benefit from it. Going by it , the Supreme Court had put trials of MPs and MLAs in criminal cases, that attract punishment of two years or more, on a stopwatch. The court said the trial of lawmakers have to fast tracked within one year of filing the chargesheet but its hardly being implemented, says the PIL. Raising several questions of law, the fresh public interest litigation asks-Can we achieve the golden goals set out in preamble of the constitution without reforming the existing electoral system and polity, which is full of Corruption Criminalization Casteism Communalism and Nepotism? Can we maintain the citizen’s faith in Socialism Secularism and Democracy, the way our elected representatives are behaving and dividing the society on Caste and Religion basis? Do we need strong and effective Rules, Regulations and Code of Conduct for de-criminalization and de-communalization of politics and for eradication of Corruption, Casteism and Nepotism from electoral system? Why only six years ban against convicted person, involved in serious crime and corruption? Why not Lifetime ban on contesting the election, forming own political party and becoming office bearers of registered political party against convicted person involved in serious crime and loot? Such a demand was already being raised at various forums, citing how the trial of JMM leader Shibu Soren, RJD leader Lalu Prasad and Congress MP Rasheed Masood had gone on for years and they enjoyed public office, including top posts, during the period. Following the furore the Centre too, had mooted setting up fast track courts to try influential persons, including MPs, MLAs, former MPs and MLAs and also corporators. The issue had assumed importance in the backdrop of a total of 1,460 MPs and MLAs serving in the last lok sabha declaring criminal cases against themselves in their affidavits submitted to the Election Commission. "Such cases have social ramifications because those persons in spite of their criminal disposition can pervasively enter and influence the political and democratic process. 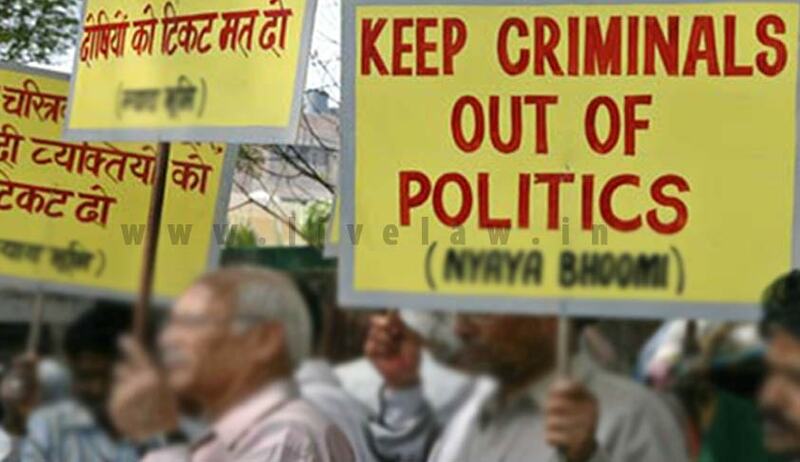 It hardly needs emphasis that the criminalisation of politics is a malady that is seriously bothering the society at the present juncture," the law commission had said. Quoting reports of civil society NGOs, Alliance of the Association for Democratic Reforms and the National Election Watch, the law commission had said 172 MPs in the last lok sabha are accused in criminal cases and out of them 78 are accused of serious offences such as murder, attempt to murder, abduction, etc. "If this situation is allowed to remain, the fundamental right of citizens to have a clean democratic process will be in jeopardy," the panel added. "If the accusations against such persons remain uninvestigated or investigated in a slipshod manner, it gives rise to a reasonable suspicion that the police is in the grip of their influence. If the things are left out to take their own course without any scrutiny or monitoring at higher levels, the criminal justice process will take a devious course and throw up a challenge to the rule of law", the law commission said. The panel pointed out that experience showed occurrence of long delays both in investigation and trial because of the influence these accused wield with the police and witnesses.